If you want to teach in Texas, you must pass the Texas Examinations of Educator Standards, or TExES exam. The following information provides a framework for better understanding test TExES test. You’ll find the paradigms below will support your ability to answer real test questions. Therefore, keep the following information in mind as you take TExES practice tests and review your prep guides. Supplemental TExES tests are required to teach in some areas, such as EC-6 Core Subjects Special Education certification or the English as a second language TExES. Your Texas teacher preparation program will guide you here. You must have the approval of your teacher prep program to register for the state TExES exams (info compiled from https://twu.edu/texes-prep/about-texes-exams). Why take TExES Test? The timeline below shows the development of the Texas Examinations of Educator Standards. 1993 Legislature passed Senate Bill 7 to try to level the funding field for all schools and created its education accountability system, a model for No Child Left Behind. This system measures and holds schools accountable for student performance on assessment tests and dropout rates. Today, accountability continues to be measured. The TExES tests are just one of the ways the state works to hold schools accountable. Info taken from An Overview of the History of Public Education in Texas (https://twu.edu/texes-prep/about-texes-exams). The Texas Education Agency (TEA) creates a five-year Strategic Plan which is revisited every two years. The plan is the agency’s blueprint for how it will spend the funding it receives for public education. Within that document, assessments play a large role. Accountability is part of that plan. A part of their special focus for the next five years is providing strong foundations in both reading and math and improving low-performing schools. The Texas State Board for Educator Certification has been established to recognize teachers as professionals and to oversee certification. The State Board for Educator Certification (SBEC) approves certification standards for each field. These standards are the basis for the TExES tests. The SBEC also established minimum passing standards for each test, with input from committees of Texas educators. The TExES exam is taken on computer. The TExES exams are comprised of 60-200 multiple choice questions and can also include some open-ended or pronunciation questions, depending upon the credentialed area. Each exam has a price tag: $115 for most exams; $58 for individual CORE tests (801-809). The minimum passing score is 240, a scaled score, for most tests. TExES Core Subjects 4-8 and EC-6 tests are reported as pass or not pass. You must earn a passing score for each individual subject area in order to pass the overall test. Selected-response/multiple-choice sections are based on the number of questions answered correctly. Incorrect answers are not deducted from the total, so it is better to guess than not to answer at all. Because the tests are revised and add new questions from time to time, some questions may not be scored at all. Those questions are used to learn more about the validity of the questions themselves. They do not count against your score. Candidates must provide consent from an EPP, or Educator Preparation Program, in order to register. Under Texas Education Code §21.048, candidates are limited to a total of 5 attempts to pass a certification exam. No matter when the attempts occurred, all attempts of the same test will count toward that limit of 5 attempts. What Causes Candidates to Fail? The Institute of Education Science says that “forgetting is a reality of life.” So why bother studying? Test preparation research shows that the use of “spaced” learning and “strategic use of quizzing” can help us remember material we learned last month or last year. How Can I Pass the TExES the First Time? When “accountability” started to mean “high stakes tests”, a lot of energy went into research! Take advantage of that research to improve your test scores. Practice tests not only can improve recall, but they can reduce your test anxiety. How Do I Use the Research to Choose Test-Prep Materials? Get to know the contents of your exam by reading carefully the domain and competencies listed. Any test-prep materials MUST be up-to-date and follow those TExES guidelines, even down to the percentage of types of questions and the scoring. More than one practice test should be offered. This gives you time to learn from your mistakes as you read through the thorough explanations of each correct and incorrect answer. Get familiar with the wording of the test as well as the answer. Do some questions consistently trick you? Sometimes key words and phrases make the difference between right and wrong answers. Look for errors. If the test-prep material contains errors, can you trust the answers? Is There a Right Way to Study for the TExES? Use many short practice sessions and take some time between them. Don’t cram for days. Doing this allows your long-term memory to store information. Taking one full-length practice test worked better than taking two or more full-length tests if the tests were taken in a short time frame. Again, extend the time between practice tests. One full-length practice test taken between 1 and 6 days before the final test had the most impact. So, save one of the tests for this time period. Make sure you have more than one practice test available. Remember that you are not the only one to take high-stakes tests. Once you have used these techniques, you can pass them on to the students in your own classroom! As you take the test, place a star by the questions that take a longer time. Later, find what those questions have in common. Was it the material you did not know or was it the wording or phrasing that confused you? Understanding the problem can help you study smarter! After each session, take a 5-10 minute break to stretch, snack, or check your cell at that time. Analyze the answers, even if you chose the correct answer: look for patterns in questions and answers to find the words, phrases, or types of questions that “trick” you. Dig deeper to find out why you chose the right and wrong answers for the questions! TExES Test Preparation – Is It Worth the Time and Energy? The answer depends on how eager you are to teach and how wealthy you are. Remember that if you fail, you must wait 45 days to retake that test. It’s not hard to do the math: 1 ½ months of waiting to take it again. Remember also that each test costs $58 or $115. Prepare now to savor the moment you earn your teaching licensure the first time! Which TExES exam questions will I face on my testing date? Which subject areas should I focus on in my test schedule? How many questions will pertain to each subject area? More future Texas teachers are hoping for a better test practice focus for these Educational Testing Service (ETS) and Texas Education Agency (TEA) assessments. You don’t want vague information or practice questions that aren’t written like the questions on the real exam, so use the information below to keep focused in your review. Before you begin, please note that any percentages listed throughout these mini TExES test study guides below represent each domain’s percentages in your exam. For example, 25% means that this domain will make up 1/4th of your score. Now that’s out of the way, let’s begin! TExES Core Subjects EC-6 (291): This is one of the many required exams offered. The exam’s time is four hours and 40 minutes. This examination covers diverse subject areas in order to assess future teachers on content knowledge and professional knowledge required to be a competent educator. This TExES test has five domains, which are as follows: English, Language Arts and Reading & the Science of Teaching Reading (28%); Mathematics (18%); Social Studies (16%); Science (19%); Fine Arts, Health and Physical Education (19%). The moral of the story here may be to focus on your English Language Arts and Reading, especially if you’re not particularly strong in this domain. TExES Core Subjects 4-8 (211): This is another exam you need to prep for in order to gain your Texas state teaching license. The time allotted for the test is four hours and 50 minutes. Keep in mind as you do your study for this exam, there are 200 questions which take five hours to complete. You’ll face four domains on your exam date, which are as follows: English Language Arts and Reading (37%); Mathematics (21%); Social Studies (21%); and Science (21%). Again, you will want to focus on the English Language Arts and Reading Areas. TExES Pedagogy and Professional Responsibilities (PPR) EC-12 (160): This PPR exam is comprised of 100 multiple-choice questions and will take about five hours to complete. This assessment will cover the following four domains: Designing Instruction and Assessment to Promote Student Learning (34%); Creating a Positive, Productive Classroom Environment (13%); Implementing Effective, Responsive Instruction and Assessment (33%); and Fulfilling Professional Roles and Responsibilities (20%). TExES Pedagogy and Professional Responsibilities (PPR) for Trade and Industrial Education 6-12 (270): This Texas teaching assessment has 100 multiple-choice questions that will take approximately five hours to complete. Your TExES practice tests and study material must focus on the following four domains: Designing Instruction and Assessment to Promote Student Learning (23%); Creating a Positive, Productive Classroom Environment (15%); Implementing Effective, Responsive Instruction and Assessment (38%); and Fulfilling Professional Roles and Responsibilities (23%). Go to: See Why “Constant, Busy TExES Preparation Is Really A Form Of Laziness…. TExES Exam Dates Are Coming: Will You Be Ready? Now that we’ve covered the exams you’re required to take, let’s take a look at popular subject exams you may be taking on the big exam day. TExES Agriculture, Food and Natural Resources 6-12 (272): This TExES exam contains 100 multiple-choice questions and has a time limit of five hours. The seven domains tested are as follows: Foundations of Agricultural Education (18%); Agribusiness and Economics (12%); Plant and Soil Science (14%); Animal Science (16%); Agricultural Mechanics, Engineering, Science and Technology (16%); Natural Resources and Environmental Science (12%); and Food Science and Processing (12%). TExES American Sign Language (184): This five-hour test contains 80 multiple-choice questions in six domains. ASL domains: General Language Acquisition (15%); Second Language Acquisition (15%); Teaching ASL (25%); Linguistics of ASL(20%); Sociology and Cultural Anthropology (10%); and Aspects of American Deaf Culture (15%). TExES Art EC-12 (178): The TExES Art exam has 100 multiple choice questions to answer in a time of five hours. There are four domains in the Art test: Creating Works of Art (32%); Art, Culture and History (27%); Aesthetic Knowledge and Analysis of Art (14%); and Art Education (27%). TExES Bilingual Education Supplemental (164): This test has 70 multiple-choice questions to be answered in a five hour time span with only one domain: bilingual education. TExES Bilingual Target Language Proficiency (190): Though this test is given less than five hours, there are 84 multiple-choice and seven constructed response questions. The four domains tested are Listening Comprehension (21%); Reading Comprehension (26%); Oral Expression (29%) and Written Expression (24%). TExES Braille (283): This new TExES test has 29 multiple-choice questions and four transcriptions to be completed in a five hour time frame. The two domains tested are each worth 50% of the exam: Reading Unified English Braille (UEB) and Nemeth Code; and Producing Unified English Braille (UEB) and Nemeth Code. TExES Braille (183): This test will NOT be offered after September 2019. Its domain is 100% Braille and Nemeth Code, assessed with 25 multiple-choice questions and four constructed response questions. TExES Business and Finance 6-12 (276): This teacher certification test is made up of 100 multiple-choice questions and will take approximately five hours to complete. Your review must cover all five domains as follows: Finance (20%); Business Management (19%); Ethics, Law, Business Communication and International Business (22%); Technology and Information Systems (21%); and Leadership and Career Development (18%). TExES Chemistry 7-12 (240): This exam is made up of 100 multiple-choice questions and will take approximately five hours to complete. The test covers four domains, which include the following: Scientific Inquiry and Processes (24%); Matter and Energy (41%); Chemical Reactions (23%); and Science Learning, Instruction and Assessment (12%). TExES Computer Science 8-12 (241): This exam is comprised of 100 multiple-choice questions and will take about five hours to complete. Your Texas teacher test prep must cover these three domains, which include the following: Technology Applications Core (12.5%); Program Design and Development (35%); and Programming Language Topics (40%); and Specialized Topics (12.5%). TExES Dance 6-12 (279): This four-domain exam is a five-hour 100 multiple-choice question exam. The four domains are as follows: Dance Elements and Skills (41%); Dance Creation and Production (18%); Dance Culture, History and Analysis (18%); and Dance Education (23%). TExES Deaf and Hard-of-Hearing (181): This five hour TExES test includes 100 multiple-choice questions. The four domains on the test are as follows: Understanding Students Who Are Deaf or Hard-of-Hearing (27%); Promoting Student Learning and Development (33%); Promoting Student Achievement in English Language Arts and Reading (20%); and Understanding the Professional Environment (20%). TExES Educational Diagnostician (153): This five hour exam asks 100 multiple-choice questions which are to be answered in the five hour time limit. The four domains on the test are as follows: Students with Disabilities (22%); Assessment and Evaluation (33%); Curriculum and Instruction (22%); Foundations and Professional Roles and Responsibilities (22%). TExES English as a Second Language Supplement (154): This exam is made up of 70 multiple-choice questions. You are given five hours to complete it. This exam has three domains, so be sure that you’ve studied the following subject areas: Language Concepts and Language Acquisition (25%); ESL Instruction and Assessment (45%); and Foundations of ESL Education, Cultural Awareness and Family and Community Involvement (30%). TExES English Arts Language and Reading 4-8 (117): This test is made up of 100 multiple-choice questions and will only take you about five hours to complete. This Educational Testing Service (ETS) and Texas Education Agency (TEA) standardized exam for teacher certification only has two domains, which include the following: Language Arts, Part I: Oral Language, Early Literacy Development, Word Identification and Reading Fluency (33%); and Language Arts, Part II: Reading Comprehension, Written Language, Study and Inquiry and Viewing and Representing (67%). TExES English Arts Language and Reading 7-12 (231) exam: This exam is different from its counterpart because it includes 2 constructed responses in addition to 100 multiple-choice questions. You have five hours to complete these test questions in the test center. Your TExES practice exam and preparation guides must cover the following four domains: Integrated Language Arts, Diversity Learners, and the Study of English (15%); Literature, Reading Processes, and Skills for Reading Literary and Nonliterary Texts (40%); Written Communication (30%); and Oral Communication and Media Literacy (15%). TExES English Language Arts and Reading/Social Studies 4-8 (113): This test contains 120 multiple-choice questions to be answered in five hours. The four domains tested are as follows: Language Arts Part One: Oral Language, Early Literacy Development, Word Identification and Reading Fluency (17%); Language Arts Part Two: Reading Comprehension, Written Language, Study and Inquiry and Viewing and Representing (33%); Social Studies Content (36%); Social Studies Foundations, Skills and Instruction (14%). 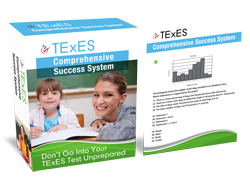 TExES Gifted and Talented Supplemental (162): This new TExES exam consists of 80 multiple-choice questions to be answered in a five-hour time limit. The two domains tested are Foundations of Gifted and Talented Education (40%) and Assessment, Curriculum and Instruction (60%). TExES Health EC-12 (157): This exam is comprised of 100 multiple-choice questions, which you’re only given five hours to answer. Your Texas teacher certification exam prep must cover five domains, which include the following subjects: Personal Health (26%); Healthy Interpersonal Relationships (20%); Community and Environmental Health and Safety (20%); Health-Related Skills and Resources (20%); and The School Health Education Program (14%). TExES Health Science 6-12 (273): This five-hour exam contains 100 multiple-choice questions. The four domains tested are as follows: Academic Foundations (19%); Medical Sciences (20%); Occupational Knowledge (20%); and Professional Responsibilities (20%). TExES History 7-12 (233): This teaching license assessment contains 100 multiple-choice questions, which can be completed within the allotted five hours. Include all four domains important for potential history teachers in your practice schedule. These domains include: World History (30%); U.S. History (36%); Texas History (20%); and Foundations, Skills, Research and Instruction (14%). TExES Journalism 7-12 (256): 100 multiple-choice questions assess your knowledge of journalism in this five hour test. Domains include the following: Mass Media and Communication (28%); Journalistic Writing and Photojournalism (32%); Student-Produced Media (20%); and Journalism in the School Community (20%). TExES Languages Other Than English (LOTE): Four languages are assessed in the TExES LOTE exams. Each of the languages has its own exam listed below. Five hours is the allotted time for any of the tests. TExES (LOTE) French (610): 120 multiple-choice questions and 8 constructed-response questions are contained in this exam. These are the domains tested: Instruction and Assessment (34.6%); Cultural Understanding (8%); Interpretive Listening (16.7%); Interpretive Reading (16.7%); Written Expression (12%); and Oral Expression (12%). TExES (LOTE) German (611): Just like the French exam, the German test also includes 120 multiple-choice questions and 8 constructed-response questions. The domains tested are as follows: Instruction and Assessment (34.6%); Cultural Understanding (8%); Interpretive Listening (16.7%); Interpretive Reading (16.7%); Written Expression (12%); and Oral Expression (12%). (LOTE) Latin (612): This test is made of 101 multiple-choice questions and 15 pronunciation tasks. The four domains are Reading Comprehension (50%); Writing (20%) Cultural Understanding (20%); and Pronunciation Skills (10%). TExES (LOTE) Spanish (613): The Spanish exam is divided just as the French and German tests. 120 multiple-choice questions and 8 constructed-response questions are included. The domains tested are as follows: Instruction and Assessment (34.6%); Cultural Understanding (8%); Interpretive Listening (16.7%); Interpretive Reading (16.7%); Written Expression (12%); and Oral Expression (12%). TExES Life Science 7-12 (238): This standardized test for Texas educators is designed to assess the life science knowledge that you’ll need to possess to lead a Texas classroom of your very own. This assessment contains 100 multiple-choice questions and covers six domains. Your TExES study guide must include the following: Scientific Inquiry and Processes (15%); Cell Structure and Processes (20%); Heredity and Evolution of Life (20%); Diversity of Life (20%); Interdependence of Life and Environmental Systems (15%); and Science Learning, Instruction and Assessment (10%). TExES Marketing 6-12 (275): This TExES exam contains 100 multiple-choice questions which you can answer in up to five hours. The four domains tested are as follows: Foundations of Marketing (25%); Marketing Principles (33%); Business Communication, Problem-Solving (17%); and Technology and Marketing Education Program (25%). TExES Mathematics 4-8 (115) exam: This standardized exam for teachers is designed with 90 multiple-choice questions that can be completed within five hours. This evaluation contains six domains, which include the following: Number Concepts (16%); Patterns and Algebra (21%); Geometry and Measurement (21%); Probability and Statistics (16%); Mathematical Processes and Perspectives (10%); Mathematical Learning, Instruction and Assessment (16%). TExES Mathematics 7-12 (235): Be aware in your TExES test practice, this assessment is designed to assess your mathematical knowledge over the course of 100 multiple-choice questions. These questions must be completed within five hours. This teaching exam contains six domains, which include the following: Number Concepts (14%); Patterns and Algebra (33%); Geometry and Measurement (19%); Probability and Statistics (14%); Mathematical Processes and Perspectives (10%); and Mathematical Learning, Instruction and Assessment (10%). TExES Mathematics, Physical Science and Engineering (274): The TExES exam uses 135 multiple-choice questions to test your knowledge of these fields. Five hours is allotted for the test. The 12 domains tested are as follows: Number Concepts (5%); Patterns and Algebra (12%); Geometry and Measurement (7%); Probability and Statistics (5%); Mathematical Processes and Perspectives (3%) and Mathematical Learning, Instruction and Assessment (3%); Scientific Inquiry and Processes (5%); Physics (13%); Chemistry (14%); and Science Learning, Instruction and Assessment (3%); The Engineering Method (17%); and The Engineering Profession (13%). TExES Music (177): This five-hour exam includes 90 multiple-choice questions. The test measures these domains : Listening (17%); Music, Theory and Composition (25%); Music History and Culture (17%); Music Classroom Performance (25%); and Music Education (17%). TExES Physical Education EC-12 (158): This test has 100 multiple-choice questions which you are to answer within 5 hours. The domains tested are as follows: Movement, Skills and Knowledge (38%); Health-Related Physical Fitness (31%); and the Physical Education Program (31%). TExES Physical Science 6-12 (237): This exam is designed to assess your knowledge of physical sciences necessary to lead a Texas classroom of your own. This ETS and TEA exam has 100 multiple-choice questions that should be completed over the course of five hours. This exam contains four domain names, which include: Scientific Inquiry and Processes (14%); Physics (36%); Chemistry (41%); Science Learning, Instruction and Assessment (9%). TExES Physics/Mathematics 7-12 (243) exam: This Texas educator exam contains 120 multiple-choice questions that should be completed over the course of five hours. This is one of the larger TExES exams, as it contains nine domain areas. Be sure to schedule the following content areas in your TExES practice: Number Concepts (7%); Patterns and Algebra (16%); Geometry and Measurement (10%); Probability and Statistics (7%); Mathematical Processes and Perspectives (5%); Mathematical Learning, Instruction and Assessment (5%); Scientific Inquiry and Processes (7%); Physics (39%); and Science Learning, Instruction and Assessment (4%). TExES Principal (068): Five hours are allotted for this 120 multiple-choice exam. The three domains tested are as follows: School Community Leadership (33%); Instructional Leadership (44%); and Administrative Leadership (23%). TExES Reading Specialist (151): The Reading Specialist exam consists of 100 multiple-choice questions in four domains: Instruction and Assessment: Components of Literacy (57%); Instruction and Assessment: Resources and Procedures (14%); Meeting the Needs of Individual Students (14%); and Professional Knowledge and Leadership (14%). TExES School Counselor (152): The 100 multiple-choice questions on this test can be completed in five hours. The three domains tested are as follows: Understanding Students (30%); Planning and Implementing the Developmental Guidance and Counseling Program (40%); and Collaboration, Consultation and Professionalism (30%). *NOTE: According to the TExES website, test materials “will continue to reference the terminology, criteria and classifications referred to in the fourth edition of Diagnostic and Statistical Manual of Mental Disorders (DSM-IV-TR) until further notice, even though the Fifth edition was published in 2013. TExES School Librarian (150): Plan for 100 multiple-choice questions to be answered in five hours. The three domains tested are as follows: Teaching, Learning and the School Library Environment (25%); Program Management, Leadership and Connections to the Community (30%); and Librarianship, Information Science and Technology (45%). TExES Science 4-8 (116): This exam is comprised of 90 multiple-choice questions that should be completed over the course of five hours. These questions are designed to exam your knowledge of major scientific subjects. These five domains to focus on in your TExES study books are: Scientific Inquiry and Processes (22%); Physical Science (22%); Life Science (22%); Earth and Space Science (22%); and Science Learning, Instruction and Assessment (13%). TExES Science 7-12 (236) exam: This is one of the larger exams, as it contains 140 multiple-choice questions that need to be completed over the course of five hours. After TExES exam registration there is no time to waste because this assessment contains a whopping ten domains. They include the following content areas: Scientific Inquiry and Processes (10%); Physics (20%); Chemistry (20%); Cell Structure and Processes (8%); Heredity and Evolution of Life (8%); Diversity of Life (8%); Interdependence of Life and Environmental Systems (6%); Earth’s History and the Structure and Function of Earth Systems (9%); Components and Properties of the Solar System and the Universe (6%); and Science Learning, Instruction and Assessment (5%). TExES Social Studies 4-8 (118): This Texas Examination of Educator Standards is comprised of 90 multiple-choice questions that are designed to exam your knowledge of major social studies topics. You should expect to complete these questions over the course of five hours. The two domains that will be included in this exam are Social Studies Content (71%) and Social Studies Foundations, Skills and Foundations (29%). TExES Social Studies 7-12 (232) exam: This Texas examination for educator certification is made up of 140 multiple-choice questions, which makes it one of the larger subject exams. You’re expected to complete these questions over the course of five hours. There are six domains that you’ll need to know about, which include the following: World History (15%); U.S. History (20%); Texas History (13%); Geography, Culture and the Behavioral and Social Sciences (13%); Government and Citizenship (13%); Economics and Science, Technology and Society (13%); and Social Studies Foundations, Skills, Research and Instruction (13%). TExES Special Education EC-12 (161): 150 multiple-choice questions are contained in this test which will take up to five hours. The four domains tested are as follows: Understanding Individuals with Disabilities and Evaluating Their Needs (13%); Promoting Student Learning and Development (33%); Promoting Student Achievement in English, Language Arts and Reading and in Mathematics (33%); Foundations and Professional Roles, and Responsibilities (20%). TExES Special Education Supplemental (163): 100 multiple-choice questions are contained in this test which will take up to five hours. The four domains tested are as follows: Understanding Individuals with Disabilities and Evaluating Their Needs (20%); Promoting Student Learning and Development (50%); Foundations and Professional Roles, and Responsibilities (30%). TExES Speech 7-12 (129): This test has 100 multiple-choice questions which you will have five hours to finish. The domains on this TExES exam are as follows: Communication Processes (31%); Speaking and Listening in Different Contexts (38%); and Speech Education (31%). TExES Superintendent (195): There are 110 multiple-choice questions which can be answered in a five-hour time limit. The three domains tested are as follows: Leadership of the Educational Community(40%); Instructional Leadership (30%); and Administrative Leadership (30%). TExES Technology Applications EC-12 (242): Keep in mind during exam practice this examination is made up of 100 multiple-choice questions, which will need to be completed over the course of five hours. Future Texas teachers should expect to be tested on four domains, which include the following: Technology Applications Core (15%); Digital Art and Animation (30%); Digital Communication and Multimedia (25%); and Web Design (30%). TExES Technology Applications 6-12 (171): Keep in mind during exam practice this examination is made up of 100 multiple-choice questions, which will need to be completed over the course of five hours. Future Texas teachers should expect to be tested on six domains, which include the following: Fundamentals of Teaching (17%); Communication (14%); Manufacturing (17%); Construction (17%); Energy, Power and Transportation (17%); Biotechnology and Computer Technology (17%). TExES Theatre EC-12 (180): This assessment is comprised of 100 multiple-choice questions that will need to be completed over the course of five hours. Be sure your TExES practice test and test prep manuals cover the following five domains: Creating, Performance and Producing Theatre (25%); Design and Technical Theatre (31%); Theatre History and Culture (13%); Responding To and Analyzing Theatre (13%); and Theatre Education (19%). TExES Visually Impaired (182): This five hour TExES test includes 100 multiple-choice questions. The four domains on the test are as follows: Understanding Students With Visual Impairments (23%); Assessment of Students With Visual Impairments (18%); Fostering Student Learning and Development (41%); and Professional Knowledge (18%). If you need any more TExES exam information before or after registration, you can visit the official Texas Examinations of Educator Standards ETS site. Now that you have this exam at a glance in hand, you should have the tools you need to get in front of a Texas classroom of your own.